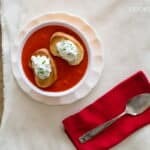 Hello Dear Cooking Friend and welcome to my Roasted Bell Pepper Slow Cooker Soup Recipe and 20 more bell pepper recipes from some of my favorite bloggers. What a Peppertastic day! Over the past 7 days I’ve been celebrating a Pepper Party with 20 other food bloggers. Between us we’ve already shared over 40 bell pepper recipes and today we’re bringing you another 20. Scroll down to see today’s bell pepper recipes. And make sure you visit the bell pepper recipes from day one and the bell pepper recipes from day two as well. What else do I have for you today? 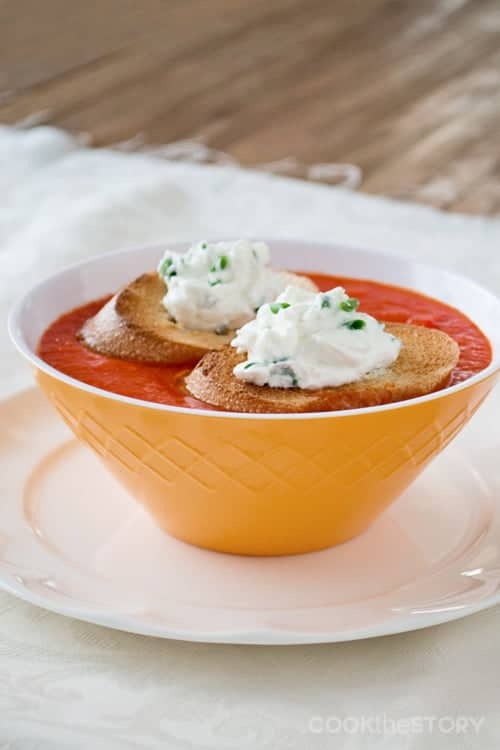 My recipe for Roasted Bell Pepper Slow Cooker Soup with Goat Cheese Toasts is down below. Scroll down. You’ll see it. Steak Fajita Bell Pepper Boats from It’s Yummi! Peppers Stuffed with Everything Good by Healthy. Delicious. I hope you love this slow cooker soup as much as I do! For this soup you roast the bell peppers in the slow cooker, remove their peels then add the rest of the ingredients, blend and heat. The toasts come together really quickly as well. This recipe yields 3.5 cups, enough for 4 appetizer servings or 2 bigger bowls full. Rub the inside of the slow cooker with 1 teaspoon of olive oil. Add the peppers and 1 tablespoon more of olive oil. Toss. Cover and cook on high for 3 hours, stirring halfway through. Turn off the slow cooker and let the peppers cool until you can handle them. Gently tug the skins off of the peppers. Many will come off in one piece. If you're having trouble, try using a paring knife to help out. Do not discard liquid that accumulated in slow cooker while cooking the peppers. Return the peppers without the peels to the slow cooker along with any accumulated juices. Add the diced tomatoes and 1/4 teaspoon salt. Purée with an immersion hand blender (or in batches in a blender). Taste and add more salt if needed. Add a pinch or two of sugar if the mixture is overly acidic. Heat soup in the slow cooker on high until hot, about 2 hours. Meanwhile, combine the goat cheese, Greek yogurt and chives with 1/4 teaspoon salt. Cover and refrigerate until needed. 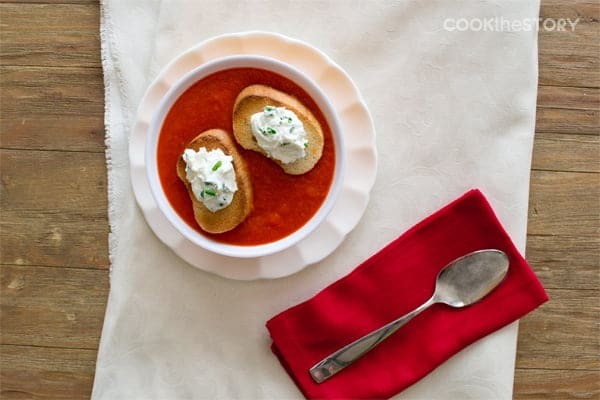 When ready to serve the soup, spoon the goat cheese mixture onto the toasts and then float the toasts on top of the soup. Thank you to Divemex for sponsoring Bell Pepper week. The growers of Divemex specialize in greenhouse grown peppers in state of the art facilities that facilitate the production of the highest quality peppers in some of the safest facilities anywhere. But most importantly, as a Fair Trade Certified company, they have an unwavering commitment to social responsibility that includes support for families of their workers, health care for all employees and a child-free environment. Isn’t that a company you can get behind? Show them that you appreciate their social responsibility with a like on Facebook. Disclosure: Divemex gave us prizes to give away to our readers during the #PepperParty. The total value of the prizes was approximately $900. In addition, I was paid to put on the Pinchatlive associated with the event. All opinions are my own. One meal I really like that incorporates bell peppers is good old sloppy Joes. Without the peppers, they’re just not the same. I’ve been meaning to stop by and tell you how much I love this recipe ever since I saw it on facebook! I love it and totally right up my alley! Oh my gosh Christine, this is just lovely. I love that you did it in a slow cooker. You are a rock star lady. Thank you so much for organizing everything this week. Such a gorgeous soup, Christine! Thank you SO much for organizing this fabulous event! This recipe looks delicious!! And to answer your contest prompt – I love stuffed bell peppers. I love extra red bell pepper in my fajitas. I love stuffed peppers !! That sounds perfect for today! I’m feeling under the weather so that soup is calling my name! to be totally honest I don’t like bell peppers and therefore don’t use them. I Just LOVE peppers. I really like them raw with ranch or some other dip or no dip. I don’t really play to much with them for appetizers but seeing all this I am going to try some of this stuff. Since I’m vegetarian I use peppers in most meals I make…stir frys, eggs, quesidillas, etc Love them! I’m looking forward to trying bacon chili with peppers. Another great pepper recipe :) I love using the slow cooker!